The Samsung Galaxy S4 follows on from the phenomenally successful Galaxy S III, and it follows the now-predictable pattern of being bigger, faster and more feature-packed than ever before. GS4: is it a phablet? The display on the Galaxy S4 has grown from the 4.0" panel on the original Galaxy S, to a 4.3" one on the Galaxy S II, 4.8" on the Galaxy S III to become a 5.0" 1080 x 1920 pixel full HD panel. Technically, the screen is a 4.99" panel which puts it a shade under the 5" phablet barrier - but the difference is like splitting hairs.. literally! A screen of this resolution can output full HD movies and video clips via an MHL-HMDI cable, and you can expect it to be able to integrate with other Samsung devices on your home network too. You can preview items on the screen by floating over them with your finger (the Note does something similar with the stylus), and the Samsung GS4 can also be used while wearing gloves. GS4: how many cores are enough? 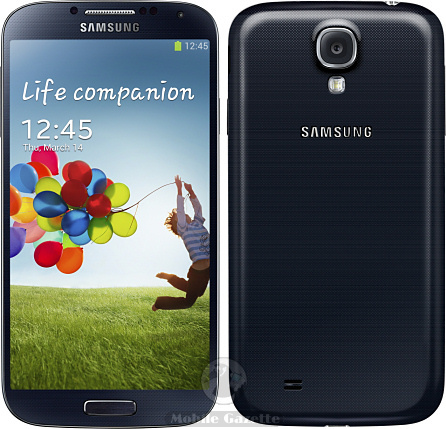 There are two versions of the Galaxy S4 available, a 1.9GHz quad-core version or a 1.6GHz eight core CPU. We haven't seen any officially confirmed benchmarks yet, but you can be pretty sure that this is going to be the fastest device around. Do you really need eight cores in a smartphone? Probably not.. but then the Galaxy S range has always been about pushing the technology as far as it can go. Unconfirmed benchmark scores indicate that the GS4 is about 40% quicker than the Google Nexus 4, although we don't know if there is a significant difference between the number of cores. At some point adding more cores will become counter-productive as there is an overhead in managing the increased complexity, but that seems to be a little way off yet. Inside is 2GB of RAM, which is becoming common in high-end devices, plus 16GB, 32GB or 64GB of internal flash memory plus a microSD slot. There's a dedicated 533 MHz graphics processor on board as well, so the GS4 does look like it will run just about anything that you can throw at it. Apart from a small handful of esoteric devices such as the Samsung Galaxy Camera, the W880 AMOLED and the old Pixon 12, all Samsung smartphone cameras seem to have been stuck at 8 megapixels. The Galaxy S4 breaks that barrier comfortably with a 13 megapixel primary snapper, which is only beaten by the Galaxy Camera.. and that can't even make phone calls. On the front is a 2 megapixel secondary camera, and Samsung have added their usual improvements here such as panoramic shooting, low-light mode and various other goodies. Both front and back cameras support 1080p HD video recording. Some interesting features are a dual shot capability which captures both the subject and the photographer at the same time, and also the ability to save a sound clip with the photograph to help to place it in context. Advanced multi-shot capabilities are available, allowing you to choose the shot you want or even to eliminate moving objects such as passers-by. GS4: Are you watching it.. or is it watching you? Eyeball tracking is a technology that has been around for a little while, it already exists in the Galaxy S III and LG announced that it would be available in the Optimus G Pro. With the GS4, the handset allows you to scroll up and down just by looking at the phone, and it will also stop playing videos when you look away. Quite how useful this will be is questionable, and some people might find the idea that the phone is watching you looking at it might be un-nerving. 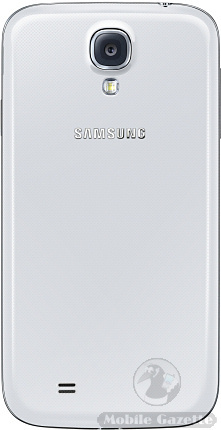 This is an Android 4.2.2 device with the Samsung TouchWiz interface on top, plus a number of Samsung's own enhancements. One of these is the S-Voice voice recognition software which attempts to compete with Apple's Siri, with a version called "S-Voice Drive" which is designed to be used while driving. Again, this is one of those applications which might seem a bit of a gimmick, but some people may well find that it is just the thing they have been looking for. One novel feature is "Group Play" which enables a group of connected GS4 phones to play the same music, media or games at the same time. The Galaxy S4 also uses a new system called "Knox" to separate home and work functions on the handset. On the fly translation is also available, which even allows for two people to converse in different languages in real-time. There are a variety of health and lifestyle apps bundled too. The S4 can talk to a Samsung HomeSync server in your home to synchronise data in a "family cloud" without the storage restrictions of commercial online services. Samsung also have an application to allow you to migrate data from just about any other smartphone to the GS4. Compared to the Galaxy S III, the Galaxy S4 has almost the same footprint despite the smaller size, but is about 1mm thinner and 3 grams lighter. Samsung also say that the S4 is stronger than S III. Inside is a 2600 mAh removable battery. The Galaxy S4 supports LTE in certain markets, HSPA+, WiFi, Bluetooth 4.0 and USB connectivity, plus GPS and GLONASS positioning systems and it also comes with a full array of sensors including a digital compass, thermometer and humidity sensor. Single-SIM and dual-SIM versions will be available, depending on region, and the GS4 also supports NFC, but it seems that wireless charging is not supported as standard although we suspect that it might be an option. Also, in what seems like a throwback to old days the S4 has an infra-red controller in, although these days it is designed to control multimedia devices rather than for talking to other phones. The design does bear a resemblance to the Galaxy S III, but it does seem a bit more slabby. The polycarbonate front and back have a subtle pattern on them though, and we suspect that this is another one of those phones that looks better in real life than in photographs. 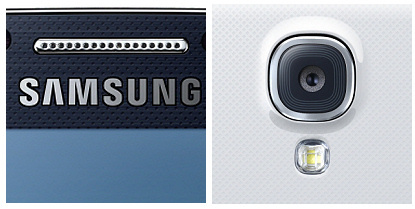 The GS4 is available in black or white colour schemes. Estimated availability of the Galaxy S4 is from the end of April onwards although this may vary from country to country. No guidance was given on pricing, but we would expect the GS4 to retail for between €550 and €600 when it hits retail channels.